A library for computational chemistry. goChem is an open-source library for simplifying the common tasks of a computational chemist at a classical and quantum level. Although it is somewhat bio-oriented, it aims to be useful for chemistry in general. goChem provides a nice set of features including geometric analysis, compatibility with several structre and trajectory formats, and interaction with several quantum-chemistry packages. In addition, goChem provides a simple way for applications to be turned into PyMOL plugins. In this way, goChem applications can easily have a graphical user interface. The library aims at ease of usage, simplicity and maintainability. Performance is not sacrified, and making proper use of multi-core machines is also a goal. The developer dedicates his work to the long life of the Ven. Khenpo Phuntsok Tenzin Rinpoche. 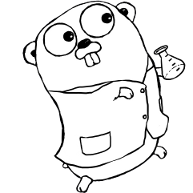 Note: The Chemistry Gopher is a modification by Sebastian Franchini of the Go Gopher by Renee French.